I am Lisa,my husband & I own a couple of villas in Coral Bay, we emigrated to Cyprus in 2006, with our 2 children. Our children now attend the International School & love life here. Felix looks after the pool and maintenance and will do your welcome meeting , I look after our villas & cater for you should you want me to. We lived in Villa Limone cy1103 whilst we had our new home built and now have rented Limone out for the past 9 years, gathering other a couple of other villas. We live locally (3mins drive away) we can provide that added extra personal service, you can not often get, ie. sorting cars, taxis. We are both UK hospitality trained so offer meals on arrival, barbecues prepared just for you, beer in the fridge or wine from a local vineyard. We personally visit you after your arrival and are only a phone call away for your entire stay. We came on honeymoon to Coral Bay in 2001, we had been looking to buy abroad for a couple of years and Coral Bay ticked all the boxes so on a mad impulse we bought a lump of mud! After our decision to emigrate and the rental going so well we started to look for another property, we found Finikia in 2008, a perfect location but a bit of a wreck, we took the plunge bought it, gutted it, new kitchen, bathroom, decor, furniture and now have rented it ever since! The villa is a perfect location, amazing blue flagged beaches, great restaurants, sun shines most days, its a peaceful location yet everything is in walking distance so you don't need a car unless you want to explore the island. What more could we want? Brand new modern bathroom with bath with shower over, WC and washbasin. Cloakroom downstairs with WC and wash basin. A wonderfully large airy open plan room with patio doors to dining terrace, large leather settees, lamp, coffee table, sideboard, satellite TV & DVD,WIFI & stereo. Brand new fully fitted solid wood beech kitchen with granite work tops, integrated electric oven and grill, gas hob, fridge/freezer, microwave, washing machine, dishwasher, iron and ironing board, toaster, kettle and cool water dispenser. Coral Bay is approx 1 hour 30 mins from Troodos Mountains the ski season is December to March, with 10 different runs for all levels, this area is beautiful out of ski season and known for biking and hiking. Paphos is the golf resort of the island, with three courses and more under construction. The wonderful Aphrodite Hills is East of Paphos, it’s a champion standard course being par 70/71 and 6232m, complete with excellent on site facilities and spa for those who don’t play golf! Secret Valley currently and 18 hole course again East of Paphos, panoramic views and is par 72 and 6120m, it is currently being extended to a 36 hole course! Tsada, this is 20 mins away an elevated position 550 metres above sea level ensures cool breezes in the summer, its again par 72 and 6060m, it has been redesigned and constructed in summer 2007. A fabulous new golf club opened in 2012 Elea golf club beautiful greens, stunning views, lovely club house. Our first time in Coral bay and pleased with our choice of Villa. Lovely location just minutes from the sea and some excellent local bars and restaurants. The main strip is about 15 mins walk. Excellent comms all throughout the booking process with Lisa and Felix was on hand throughout the holiday if needed. We had a late arrival and had ordered some food and drinks from Lisa that were very welcome indeed. Thanks for making our family holiday so enjoyable. Thank you for taking the time to write a lovely review., we are so glad you had a great stay with us.Its lovely for future guests to hear how close we really are to the beach and several bars and restaurants yet you can walk easily into the main coral bay strip. glad you enjoyed our food and drinks. we hope you choose to stay with us again and many thanks for looking after the villa so well. Sunny half term break in beautiful area! Thank you Lisa and Felix - we had a wonderful holiday! The weather was amazing all week (27 degrees and felt much hotter!) We loved the pool and the bbq and ate at the villa most of the time, enjoying the meat from Philippos's supermarket, and the fresh pittas and hummus. We are sad to be back home eating inside! The villa is on a quiet cul-de-sac, is spacious and light, with a lovely balcony outside the back bedrooms. We found the double bed a little small, but probably we're just used to our big king-size at home, and we're both quite tall! The sea caves were also definitely worth a visit, only an 8 min drive away. We enjoyed a drink and the views from Sea Caves Lounge Bar. It was also lovely to be within walking distance of Corallia beach. We went for early morning swims before it got too hot. All in all a lovely villa and location for us. The only slight downside was the music from the nearby touristy strip at Coral Bay (we gave this area a wide berth) which travelled over some evenings. 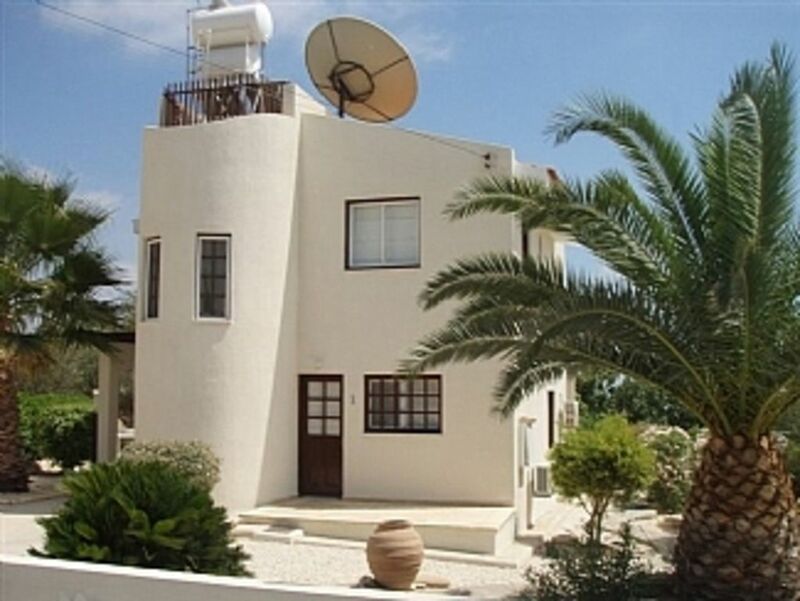 If you're looking for absolute peace and tranquillity you'd need to find a villa a bit further inland (but then you wouldn't be able to walk to the beach...), and definitely don't stay near Paphos town, as this area is super-touristy. We'd recommend this villa if you want a lovely pool, a great area for outdoor eating and a location close to the beach and historical sites. We would also recommend Cyprus as a holiday destination - the views are from the locations we visited were absolutely stunning! Thank you for your lovely review, we are so pleased you had a lovely stay with us.we too love the location as you can walk to the beach and are far enough away for the main strip not to be bothered by it, we love to walk to the local fish taverna from where you are or down to Yialos, for the traditional locals food! like you we love to stay in and barbecue the amazing meat and fish form Philipos supermarket and the fact they run you and your shopping home if you dont have a car is an added bonus. Great villa, great location, everything went smoothly. This is an ideal villa, situated close to Coral Bay amenities. Contact with Lisa and Felix was faultless. We rented a car through their local contact which got us out to great places. We would highly recommend. thank you so much for taking time to write your review we are so glad you had a lovely stay with us. its lovely for future guests to hear about the villa ad its location, U2 car hire are excellent and really look after our guests with no hidden extra costs. Great to have a car if you want to explore the island. we see you discovered sea caves and O niros and latch, all favourites of ours. We arrived late evening so welcome pack was much appreciated. We have stayed in another property managed by Lisa and Felix in the same cul de sac but this was our first time at this property. Once we had unpacked and familiarised ourselves were everything was, we immediately felt at home. Villa Finikia is very spacious and well equipped, we can't think of anything that was not provided for. The central location is ideal, close to lovely beach, with easy access to very reliable and inexpensive bus service. There are a couple of sports bars in the area, the frog and toad, did a great Sunday lunch, and a hearty breakfast menu. The whole in the wall also offer entertainment and there is also a fish and chip shop. We were not that impressed with the Irish bar near the supermarket, which never seemed to have many customers, we called in once for a snack but only full menu was available when we only wanted a sandwhich. There is a wide variety of bars and restaurants on the Main Street in Coral Bay to suit every taste. The local supermarket is well stocked but the larger supermarket Philipos has a much greater selection and they take you home which is a great service. We had a very relaxing holiday spending long hot and sunny days by the pool but there is as much,or as little to do in the area depending on your preferences. Thank you to Lisa and Felix for making our stay in your lovely home so enjoyable, we had such a relaxing stay and have already re booked for next year. We are so glad you enjoyed your stay at our villa we spent a long time renovating it and setting it up so its great to hear everything is provided for and you love the location. Its great for future guests to read and hear for guests who have stayed about the villa and its location Our bus service to paphos we agree is excellent value and we often use it . Philipos is by far the best supermarket and having its own in house deli, bakers, butchers and fishmongers and the fact they run you and your shopping back to your villa is ideal. We love this Villa so much , It is so perfect for us . Beautiful private Swimming pool For us all to enjoy and lovely clean accomadation . We always arrive late so always happy to have a welcome pack from Lisa which is so helpful when you have had a long flight. The kitchen has everything you need and if you don't want to cook or go out Lisa will cook you up one of her lovely delicious meals and deliver it to the door . The accomadation has everything you need for a great stay with or without children , even a fab book collection :) .If there has ever been a problem a quick phone call To Felix and he has sorted it asap.My kids call him ''Fix it Felix ''. The area has quite a few local bars and Taverns where you can grab something to eat and have a pint and chat to the locals .The Frog and Toad and Hole in the wall bar, great entertainment . If you want more choice you can walk to the main strip about 15 mins or go and visit one of the amazing local resturants in the area . You have two beautiful beaches right on your door step ,which do a lot of water sports too,and also quiet parts where you can just sit and relax . This is such a lovely villa and area and always feel 100% safe when Im on holiday with the kids and that is realy important for us and also to know that the owners are so close and do everything they can to make your holiday the best . Also will say about the car company we had U2 cars which were very cheap and fantastic service . A car is not necessary as everything is so close and the bus runs every 10 mins if you fancy going out further but its nice to have a car to visit all the little hidden taverns . We have recently returned from a wonderful stay at the villa. Its as described on a lovely peaceful cul de sac. Sea views from the balcony and less than 5 mins on foot to the beautiful coralia beach. We took advantage of the regular bus service to paphos harbour and its only 1.5 euros. We were amazed how many restaurants are open this time of year. The villa is spotlessly clean, beautiful crisp bed linen and a very well equipped kitchen. We met Felix a couple of times when he came to do the pool and at our welcome, he could not be more helpful, answering all queries and resolving our one issue when a lightbulb popped. Thank you so much for your lovely review. we are so pleased you had a lovely stay with us and that you weren't chilly on an evening. Its great for future guests to hear the villa really is a good place to stay all year round. We too use the bus service into paphos and in the summer the buses are all air conditioned as well and run every 10 minutes. Al guests will get to meet either Felix or myself as we feel the personal touch helps where we can give hints and tips, fix anything and generally just be there for you should you need us throughout your holiday. Due to its location it is ideal for those wanting to have a water sports holiday, there are many diving schools locally with everything from beginners courses to some superb wreck diving for the experienced diver. Georges Ranch for those who like horse riding is a 5 minute drive. Due to the climate it is popular for both walking and cycling holidays plus the benefit of the three golf courses meaning there is something for everyone. The villa was chosen for its position between 2 of the best beaches on the island. Coralia being 3 minutes walk away and Coral beach 10 minute walk - both are blue flagged beaches, they both offer a range of water sports, changing and shower facilities and snack bars. A car is not necessary due to the villas location, however one can be booked on request as can golf, spa treatments, horse riding, scuba diving etc. Nearest airport is Paphos which is a 30 minute drive. Larnaca is 1 hour 30 mins. The bus stop is 5 minutes down the road and runs every 10 minutes in the summer, 20 minutes in winter late into the night into Paphos and onto the Water Park. A taxi from the airport is approx 45 euros which can be arranged as can a very reliable car hire company. All the below distances are genuine, we have walked them dragging our two kids along! Supermarket, several restaurants and bars 2 minute walk. Coral Beach Hotel 2 minute walk. Coralia beach, 10 minute max walk to Coral Beach. 15 min stroll into Coral bay town centre. Paphos zoo 10 minute drive. Paphos town, Harbour amd Water Park 20 minute drive, Polis and Latchi 30 mminute drive. Coral Bay has everything for the perfect holiday with the two beaches , water sports, scuba diving and abundance of restaurants and bars, bank, chemist, doctor, mini golf, go carting, numerous hotels. It really is the perfect all round location, however should you wish to explore Paphos there is a regular reliable! Cheap bus service into town. Booking Notes: A booking deposit of 25% is required with the balance due 8 weeks before arrival. A security deposit of £200 is required payable on arrival and returned on departure. Changeover Day: We are fully flexible. Notes on prices: Prices are shown per week and include air conditioning and luxury welcome pack. There is a £50 surcharge for Christmas and New year week. We are currently holding 2014 prices for all bookings taken for 2015. Discount available for lets of longer than 2 weeks. Contact owner for detail.